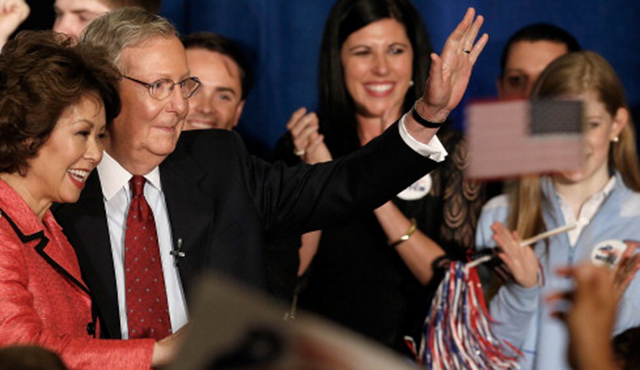 Senator Mitch McConnell waves to supporters after his victory in the state Republican primary over Tea Party challenger Matt Bevin, May 20, 2014. Credit: Win McNamee/Getty Images. This decline continued a trend noted in several surveys that asked the question a different way: whether Republicans had a favorable or unfavorable view of the movement. Republicans with a favorable view declined from a peak of 64% in August 2011 to 53% last fall, according to our October 2013 poll. The sharpest falloff during that period came among moderate and liberal Republicans. Just 27% of moderates and liberals expressed a favorable view, down 19 points from the previous June. 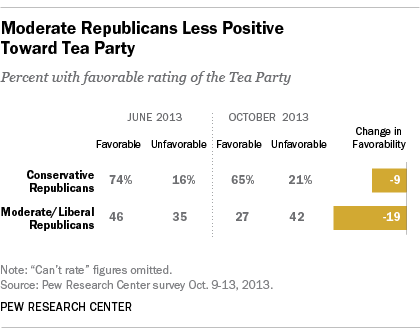 The Tea Party’s ratings declined even among conservatives, from 74% favorable in June of that year to 65% in October. Other recent polls show a similar trend. 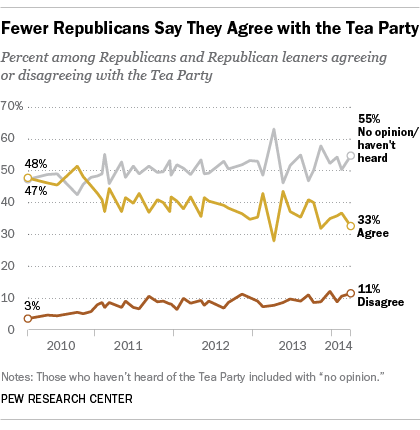 A CBS News survey conducted May 16-19 found that 32% of Republicans consider themselves to be Tea Party supporters, down 10 points since February and 23 points since July 2010. Similarly, Gallup reported that the share of Republicans and Republican leaners who called themselves Tea Party supporters had dropped from 61% in November 2010 to 41% today, according to a survey conducted in late April. However, one strength that Tea Party adherents maintain when it comes to their potential impact in the party is that they are more enthusiastic, by a 52% to 35% margin, about voting in this year’s midterm elections than all other Republicans.